Most of our lives are lived on average days, not big once-in-a-lifetime days when we get married, or pay off the house, or graduate from college. Yet, many people focus quite intently on these big goals, to the exclusion of day-to-day life. This is my effort to emphasize the days that make up 99% of our lives. For 30 days, I'm recording the regular things that I do, every day. The storm that rolled though Northern California today, photographed From West Cliff Drive, Santa Cruz. I started this project before I had anywhere to put it. Here's my laptop SSH'ed into my webserver as I'm setting it up. I see deer on this ride all the time, but I still like them, and this one has tiny antlers. My wife and I went to see "Where the Wild Things Are" downtown. West Cliff and San Jose in Santa Cruz, by my house, looking east at about 7:15am. I went and checked out Santa Cruz Open Studios with my wife and my parents. A bunch of local artists open their studios and show their art to the public. 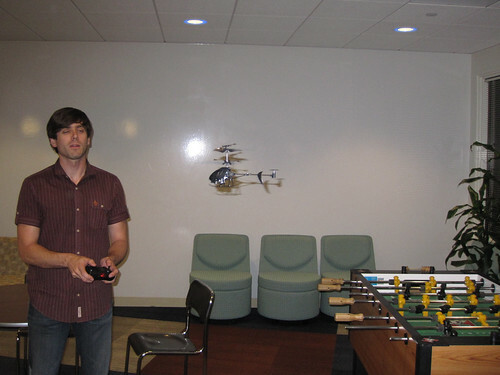 We play a bit of foosball in the office most afternoons around 4:30. Today I lost, four games to one. My wife and I took two friends from out of town to see the monarchs at Natural Bridges State Beach. I work in this office. I pretty much spent all of today there, working. While riding my bike, I saw this hawk in a tree near the top of a hill. Eventually I'll just post "Today I Went on a Bike Ride", along with the view from the top of the ride. Well, the start of one. Twitter for the command-line. It's hard to get interesting photos of programming projects, since all it really looks like is a laptop screen. Picture is pre-fix. It's not actually 100% done, I still have a little more work to do. We went to the Crow's Nest in Santa Cruz. Food was good. I pushed the latest version of our software out to world availability. I didn't want to just post another photo of a laptop screen, though, so here's our monitoring software showing the upgrade. About a month ago, I planted a lawn from seed. It's not quite mature enough to mow, so I'm pulling weeds by hand. My wife took the photo. My wife bought this plant for me a while ago. When we got it, it had flowers, but they bloomed and eventually died. Months later, after lots of water, fertilizer, sun, etc., it's finally blooming again. It's essentially an egg McMuffin and coffee, but I made it myself. Fried egg and cheese on an English muffin. I made one for my wife, too. There weren't any, completely flat ocean today. Here an Anna's hummingbird doing a supersonic flyby past a male house finch. I took this photo while sitting on my back patio with my wife. The first of November, 78 degrees, beautiful day. My wife and I rode our bikes over and went for a walk at Neary Lagoon Park here in Santa Cruz. This ladybug was in the park. I'd actually intended to check the waves to see if it looked like it was worth surfing myself, and had forgotten about the contest running this week. Once I was there, I figured I'd watch for a bit. This was a discussion about implementing data locking with reference-counted pointers in a multithreaded application. Yeah, this is the best I could come up with today. I spent all day in the office. This is James, owner of the helicopter. Image links to a video. I've been wanting to use this all month, but always had other things to post. I finally got a good opportunity, and the weather was lousy. Here's a picture from the same ride a few days ago. It's been a busy week at work. This is Ferrell's Donuts in Santa Cruz, CA. I can't really say I "fixed" my bike, because as you'll notice, the front derailleur is missing. I ordered the wrong one, so I'll have to exchange it. This is at Bonny Doon Vineyards in Santa Cruz, CA. They have some good wines, and it's right by my house. I went with my wife. This is Stella. She's looking annoyed because I picked her up and wont put her back down. Meow. I've been wanting to post this all month, but getting someone to come photograph you surfing can be tough. Also, there seems to be some camera jinx that makes the waves worse when you want to take pictures. Still, there were some little waves, and my wife got some pictures. This picture links to a video. It's day 30, and the last entry in this project. I hope you enjoyed watching my month. Oh, also, I washed the dishes tonight.